Here at the WC, you will often find us with big buns ... on top of our heads. In order to spruce ourselves up a bit, we really should start going for a more polished look with a Sock Bun. Erica from 1011 Makeup shows us how incredibly easy it is to give yourself a plumper bun ... on top of your head. It is so easy there is no excuse that we should not be sporting a sock bun everyday. You just might be interested in our new creation The Soxy | The Ultimate Sock Bun Accessory. A perfectly stitched knit 'donut' for the perfect sock bun in white, brown and black. 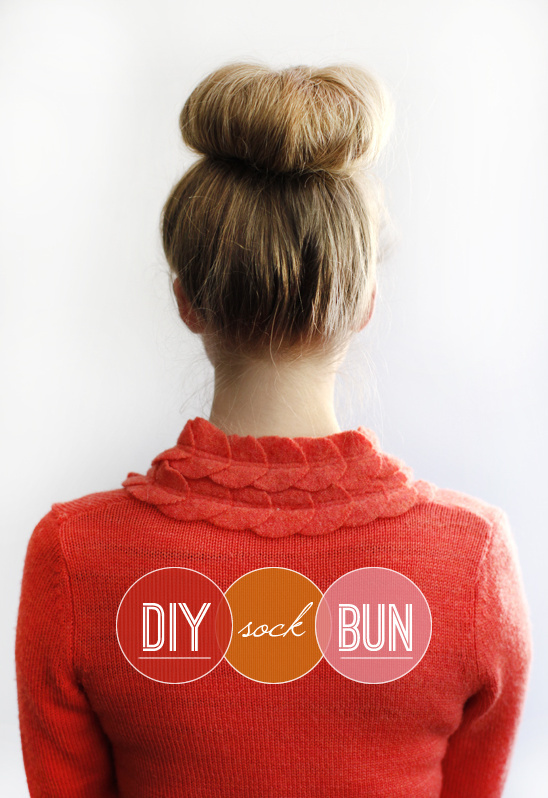 Read on for the diy sock bun tutorial from 1011 Makeup. It so easy that you have to try it. Don't forget about The Soxy | The Ultimate Sock Bun Accessory. Take a sock and cut the toe off. The thicker the the sock, the larger the bun. Try to use a sock that is similar to your hair color (light sock for light hair, etc.). Starting from the area you cut, roll the sock down, tightly, to form a doughnut shape. H&M also offers a cheater version of the doughnut. Brush out your hair and secure hair into a ponytail with an elastic band. Where you place your ponytail will be where the center of the bun rests. The higher the pony tail, the higher the bun placement. You can smooth out the hair, creating a sleeker ponytail for a more elegant bun, or allow a few wispy pieces, for a less kept, playful bun. If you have lots of layers, or very straight hair, you can slightly back comb the hair in the ponytail, prior to rolling, to help with keeping the hair together as you roll the hair down. Once you have rolled the hair completely, and the bun is resting in place, you can use the end of a comb to tuck any pieces out of place into, and under, the bun. Use bobby pins and hair pins to secure the bun (placing them under the bun to help hold in place, securing any loose pieces). Check to make sure there are no places where the sock is visible. If you can see the sock, just spread the hair and secure with a pin. Spray with a light finishing spray.